Customers rarely understand the costs involved. Sun Chocola is ok so far, but it's been a very wet year, and it's difficult to make very many judgments yet about flavor. I have really liked Sun Peach; it's a definite grow-again. I'm picking out seed to order for an outdoor summer market garden. I was hoping to be able to grow hybrids that have at least decent flavor. 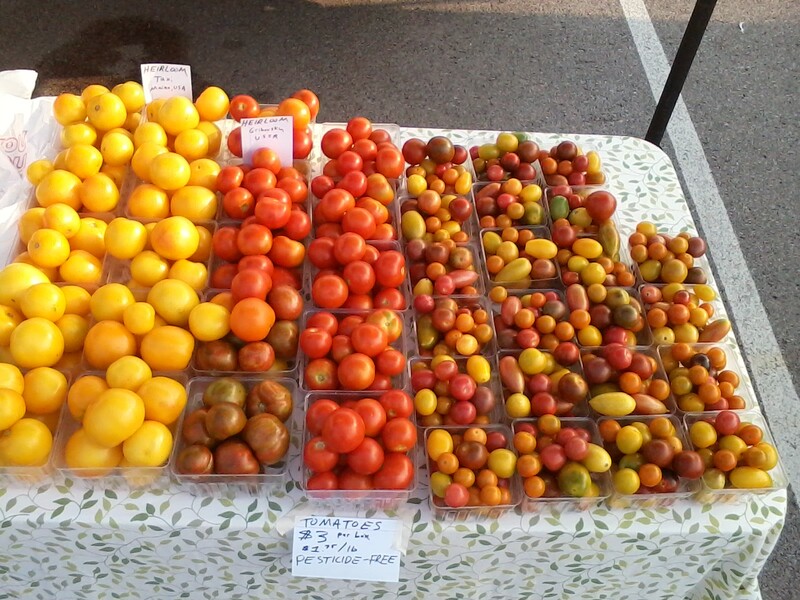 I was also wanting to have several colors of tomato to make an eye-catching display at market. Brandymaster - Red, Pink, and maybe yellow. I'm a big fan of Brandywine. I'll probably have Big Beef as another red, and I'll have Cherokee Purple, too. No one buys the black and purple tomatoes, but they at least attract attention and start conversations when people say "ewww! Those tomatoes over there don't look right." Have you ever sliced the black ones and offer tastes? I think the black and purple ones look so amazingly rich when sliced and make the prettiest salsa. Not to mention taste. I can't imagine people turning them down after tasting. Golden Sunburst is hugely productive for me,along with Carbon Copy. I'm not a big fan of Golden Sunburst but CC is my very favorite cherry,by far. The difficulty of samples is being able to comply with all the health code regulations. It's not impossible, but I would need another person to help me. That's what I like about cherries and small tomatoes. If I give an intact tomato to a customer and they eat it, that does not trigger the health code rules. I haven't tried Carbon Copy. I grow a lot of cherry varieties; I should try that one next year. I have had the same issues as Cole when it comes to samples. I don't pay as much attention to my tomatoes as I should so most of my larger varieties aren't all that nice looking. At the few places where I can still give cut samples, even the ugly tomatoes sell after people taste them. But I can't cut at my best market. So I mostly just take a large selection of cherries there. Yes the flavor sells them too. The last 2 Saturday markets we've "hawked" our heads off selling "radish pods" by offering samples. We have to talk a lot, but tasting and giving ideas on how to use them sells a lot of pods. over 3 - 5 gal buckets yesterday. My only problem with CC does split with heavy rains but when it's hot and dry the flavor is incredible. I had a fully ripe Matt's Wild Cherry today. Had forgotten how amazing they taste. I think it's only been in the ground about 45 days. I am trying Matt's Wild for the first time. I grew it mostly for seed, because I think the plants will sell well. I'm never going to grow it to sell, though. Even though they taste good, it takes a thousand of the little things to fill up a box. Tracy - I picked my first Matt's Wild today as well. I hope to have more by next weekend. Mine have been in the containers on my deck for about 40 days - not too bad, considering we had 4 inches of snow on Mother's Day, plus the Monsoon of 2015 for 3 weeks. Wi-sunflower, I have had good success with " rat-tailed radish" pods at market. But still, I am curious what ideas for uses you suggest. I just mention salads and stir fries, but I always love new (to me) ideas! My Mom loved them on sandwiches because she never had lettuce around plus it adds flavor. A restaurant pickles them. Not sure what they do with them afterward tho. In drinks ?? On a relish tray with dip. They should be batter fryable, like the french fried green beans. Just as a nibble. I get customers that just eat them as they are walking the square, like others eat the strawberries. In a soup like egg drop soup, right at the end so they just wilt. Or any "vegetable" soup. In case you can't read my bad hand-writing, the larger tomatoes on the left are Taxi and Gribovskiy. In the front middle is a box and a half of Spike, one of Fred Hempel's new varieties. I love radish pods! I always had a large patch growing wild at my So Cal home. I should find some seeds and grow them here in Oregon. I also used them as green treats for my turkeys when all the grasses dried up. They would "gobble" them up until their crops were bulging. Robbie, your display looks gorgeous! No tomatoes at market yet here in So Oregon. Cole I love the way you get past the organic thing it works for me. People see that 'pesticide-free' sign, and just start eating the tomatoes as soon as they buy them, often giving them to their kids. I feel a real obligation to keep everything as clean as I can. I was up til 2 am last night washing and polishing off all those tomatoes. I heard a daily vendor a few spaces down this morning tell a customer about their produce, "oh, it's organic; you don't have to wash it." I cringed. Yah, I hear stuff like that too and wonder how real those people are. Just because it's "organic" doesn't mean there is nothing bad on it. Some organic approved pesticides are more dangerous than anything "chemical". Red Devil dust has a very low LDL which means even a small amount can be toxic. Isn't hog flop organic and many times loaded with parasite eggs.